Yes, we recently spent some time in Cornwall and we have already seen the fabulous silver studded blue butterflies on this site. We camped between St Agnes and Perranporth. It was very close to the wild and rugged cliffs of the North Cornwall coast. This is an area of much variety. The underlying rock changes from place to place and with it the plants that grow and the animals that live there. But added to this there are the old spoil tips of the mining industry. Mostly these have reverted to nature but the change in minerals and soil adds even more variety to plant and animal life. On an area actually at the perimeter of the little Perranporth air field we spotted this moth having already watched the sun go down over the sea. This was quite a large and hairy moth and I had no idea what it was. Moths are singularly hard to identify because of the sheer number of them. 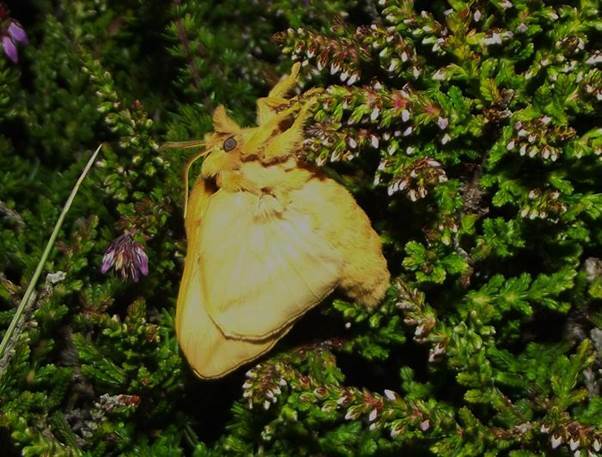 Eventually I decided it might be a canary shouldered thorn but I was by no means 100% certain so I buzzed off an email, with photo, to the Cornwall Moth Group. The reply was near instant. Thank you for the picture and info. I don’t think it’s a Canary-shouldered Thorn, as all the Thorns (including Canary-shouldered) have scalloped edges to the wings and they don’t have those furry legs. I believe it’s a freshly-emerged female Drinker Moth (possibly still drying its wings which would explain the “butterfly” position). So three cheers for the Cornwall Moth Group who have identified this moth for me. It’s a drinker moth – it’s female and has probably only just emerged. I find it really worthwhile asking people on the web. The world is a wonderfully helpful place. This Cornish Moth Group asked for specific information which I supplied and I sent the picture as well. Obviously by suggesting what it may be, albeit wrongly, I gave an indication that I had tried to identify it. I really do think you should try to identify a species first. Hopefully, that’s one more moth I’ll identify myself if ever I see one again.